It’s Friday, and that means it is time to head over to Angie’s place at The Novice Gardener for Fiesta Friday. This week is even more special though, since it is the 52nd, thus completing a full year of fun, recipe-sharing and meeting dozens of talented bloggers who all contribute to making this such a popular and successful event. To mark this milestone our fabulous hostess Angie is dedicating two weeks to the celebration. This first week we are asked to bring the starters, i.e. 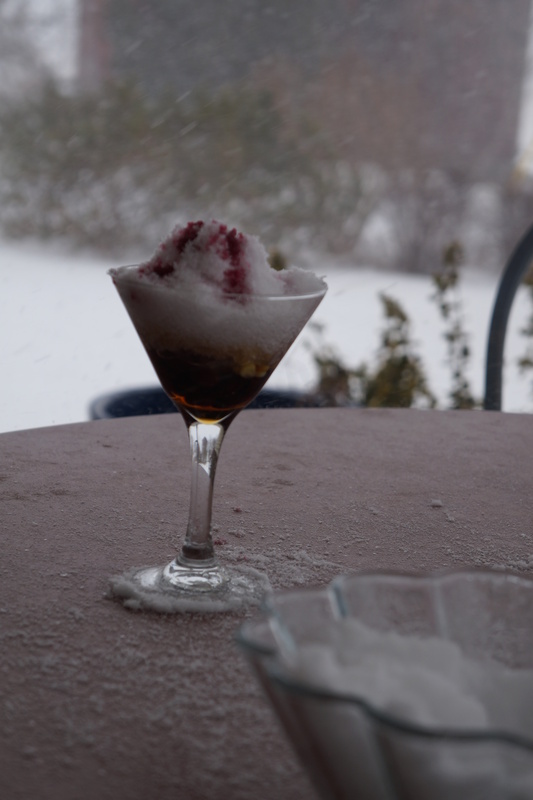 drinks and appetizers, while next week we will present the main dishes and desserts. I have noticed there has been a lot of buzz over the past few days, so I expect it is going to be a smash. You are welcome to join us and bring an original dish of your own by Wednesday. Just follow the simple guidelines as outlined here. If you haven’t prepared anything, you are still welcome to come and join the party where you will see what all the buzz is about. As co-host, along with my compatriot from the west Julianna at Foodie on Board, I will try to make myself useful, so if you have any questions, don’t hesitate to contact us. I would also like to extend a big thank you to Angie for organizing this weekly party. She has been such an inspiration, and provided a venue where we have been able to make new friends, share ideas and support for one another, and jolly up the whole blogging experience for so many. I therefore suggest we help ourselves to a drink and toast our dear host before going any further! And now for my offering to the celebration. It is an appetizer to be served with crackers or vegetables, inspired by that ever so popular recipe for artichoke dip. I have made mine with fermented Jerusalem artichokes, a rich (creamless) creamy dip with lots of flavour and healthful at the same time. 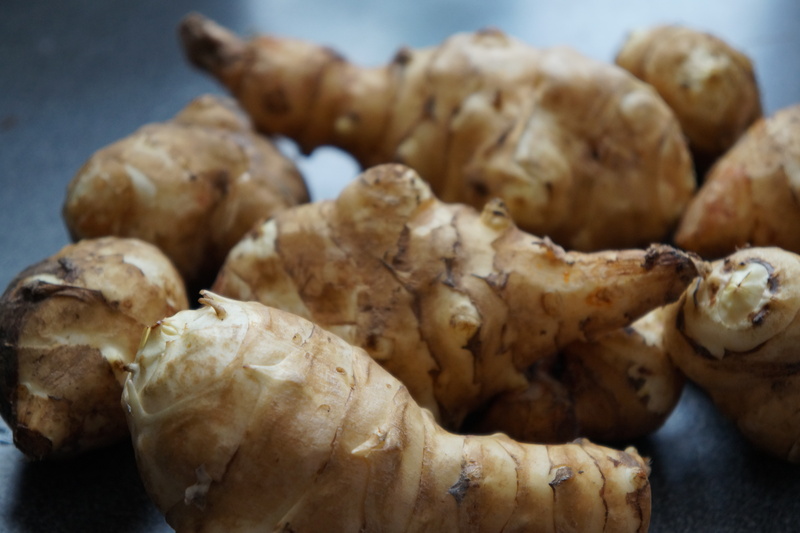 I have been using Jerusalem artichokes, or sunchokes, quite a bit, but some readers are still not convinced to eat them. I took the recipe for the ferment from this post where the problems of sunchokes are candidly outlined, and it seems that fermenting them resolves the problem. I believe it! If you are not familiar with this odd little vegetable, this is what it looks like. Once I fermented a jar of them, the dip was simple enough to make. I used one part sunchokes, 1/2 part raw cashews soaked in water, and 1/4 part steamed and chopped greens. I used Swiss chard, but spinach, kale, arugula, or just about any green would work well. I blended the drained nuts and sunchokes until smooth, and then mixed in the greens. There is enough flavour and seasoning in the ferment that you need add nothing else, other than perhaps a little garnish of paprika or sumac powder. Categories: garden vegetable, jerusalem artichoke, preserving | Tags: appetizer, Fiesta Friday, jerusalem artichokes, sunchokes, vegan | Permalink. Many people keep sumac powder in their pantries to add some lemony tang and colour, particularly to Middle Eastern dishes. I see it being used in an increasing number of recipes, and am happy that this versatile and tasty spice is catching on. 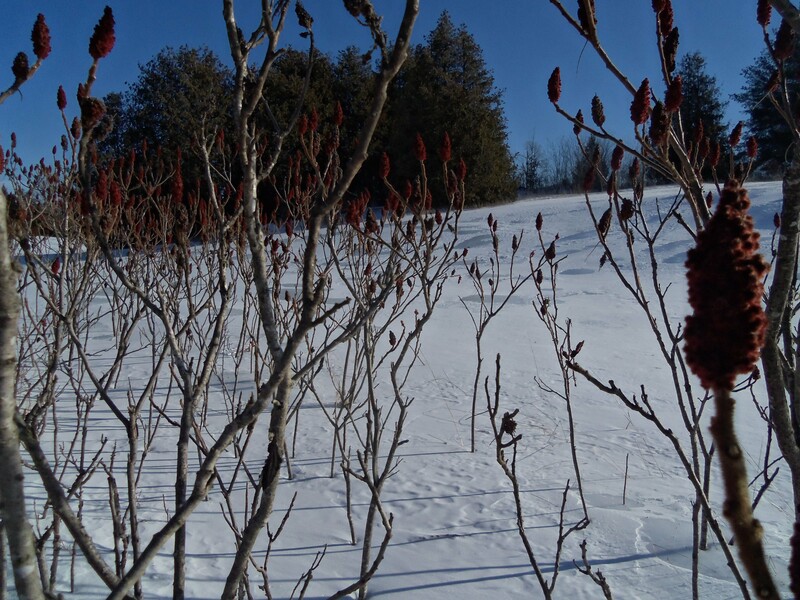 What many people don’t realize is that our local staghorn sumac in Ontario, as well as neighbouring provinces and norther states, is the same product. It is plentiful, easy to identify and gather, has a long shelf life, and is easy to turn into powder or liquid. For information on its nutritional value, I recommend looking at this article. It has been a tough year for gathering sumac in this area – just too much rain. The rains tend to wash away the tasty bits, so I only collect sumac after a long dry spell. The good thing about winter here is there is little or no rain, and the sumac is still good for picking, so I set off last week to restock my pantry. A full five minutes of picking off a few clusters of berries was sufficient to fill a sack to be dried or soaked. I have figured out a few things about preserving sumac. First, when drying, it is simpler to dry the whole cluster. It doesn’t take any longer, and the berries are easier to remove when dry. Just pop them all in a single layer in a low oven or dehydrator and leave them until they feel completely dry, about five hours. Each cluster is made up of several small cones, so if you just pull them apart, you can easily rub the berries off right down to the centre stalk. The dried berries need only be ground (I use a coffee grinder) and then sifted. The second thing I learned is if you want a liquid infusion, just covering them with tepid water and letting them soak for anywhere from 10 minutes to a couple of hours. Strain off the liquid through a cloth. I then repeated this process with more water and the second batch was as dark and tasty as the first. I prefer this method to simmering them, which although gives a deeper infusion, will destroy the vitamin C. If cooking with the infusion anyway, this is not a problem, but when I use the product raw, it is best to preserve its full nutritional value. Now that I have a good stock of sumac, I will be posting more recipes using this super local super food. Meanwhile, I did make a recipe for baked beans I have been meaning to get to for some time now. A ridiculously easy and satisfying dish for the winter months, it needed a bit of a makeover to move with the times. The addition of sumac gives it a mildly fruity flavour and richer colour than the original recipe. It is as easy to make a big batch as a small batch, and any extra can be frozen for later use without losing any of its original flavour or texture. I divided the recipe in half – to make one vegan and the other with meat. For the meat version, I used pork crackling left over from my lard rendering, but bacon, pork or sausage, raw or cooked, would work just as well. Mix all the ingredients in a saucepan or slow cooker. Bring to a boil and then simmer gently, covered, for 3-4 hours. Add more liquid if they become too dry. I am bringing this hearty winter dish to Angie’s 51st Fiesta Friday. You are cordially invited to drop in and join the party, with or without a contribution of your own. You are sure to meet some talented bloggers and find some original and tantalizing recipes. Hope to see you there! Categories: edible weeds, main dish, preserving, recipes, spice | Tags: beans, drying sumac, Fiesta Friday, foraging, staghorn sumac, sumac infusion, vegan | Permalink. The only local fish I have been able to acquire has been walleye, sometimes called pickerel, which is why all my fish recipes so far have been on this one particular species. It is a freshwater fish, very versatile, with a mild flavour. That is why whenever a kind fisherman offers me some of his catch, I gladly accept it and try and create a new recipe to do it justice. Since I have been making pates and potted meats lately, I decided to try a fish pate – something I could use for quick meals and for serving guests on short notice. 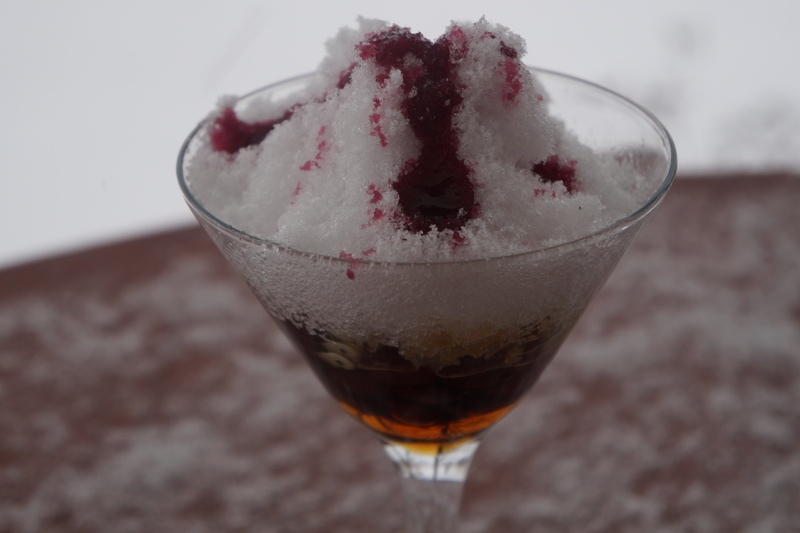 It is also a perfect party recipe to bring to the fiftieth Fiesta Friday event. Most fish pates call for smoked fish. I have yet to take up smoking, although a smoker is on my wish list. For the time being, I did add a few drops of liquid smoke, but the recipe does not require it – just an afterthought for those of us who like the flavour. I did find a recipe which resembled what I had in mind to start with, except with toasted almond slivers added which seemed a good idea in terms both of flavour and augmenting the quantity of the final product. Here is the recipe I referred to for fresh trout and almond pate. And here is my own recipe I used combining my own idea and the toasted almonds. Poach the fish in a little water in a 350 degree oven until the fish is cooked right through. While this is cooking, brown the almond slices in a skillet with 2 Tbsp of the butter. Set aside. Once the fish is cooked, remove from the oven, pour off any liquid (and keep for some other use), cool and remove any skin and bones. Put the fish in a food processor along with the remaining Tbsp of butter, the toasted almonds in butter and all the other ingredients. Process until it everything is evenly blended. Pour into a serving dish and/or in jars to be frozen for later use. Serve at room temperature on crusty bread, crackers or with salad. Categories: fish, fresh water fish, recipes | Tags: almonds, Fiesta Friday, pate, pickerel, potted fish, walleye | Permalink.